When a movie isn’t screened in advance for critics, it’s usually a bad sign. It indicates that the studio anticipates a universal thrashing or that they know their movie is a dud and they just need to release it and get it out of the way. Such was the case with “G.I. Joe: The Rise of Cobra“, which was screened at 9pm on the evening before it opened back in 2009. Sure enough, most of the reviews were negative and the outcry from many of the fans could be all over the internet and up and down the aisles at comic book conventions. None of that prevented Paramount and Hasbro from going forward with a “Joe” sequel, which is why we have “G.I. Joe: Retaliation”, now in theaters. 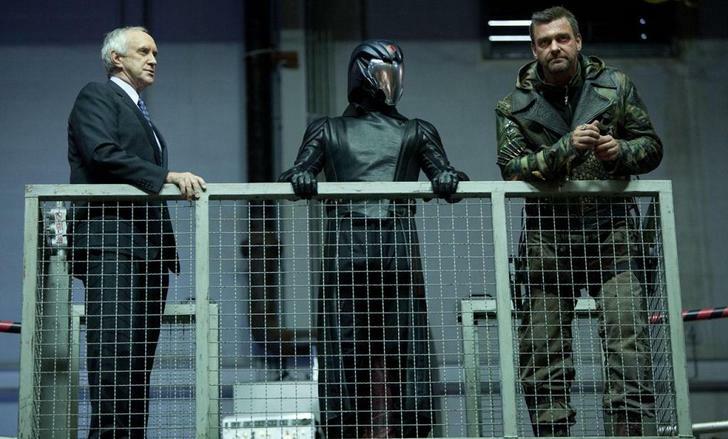 The movie picks up from the last episode, which finds the President of the United States (Jonathan Pryce, slumming it) still being impersonated by Master of Disguise, Zartan (Arnold Vosloo, barely registering as a cameo), which gives the evil terrorist organization COBRA access the power to dominate the world. During a brief covert mission in North Korea (of course), we’re introduced to the major Joe players this time around. 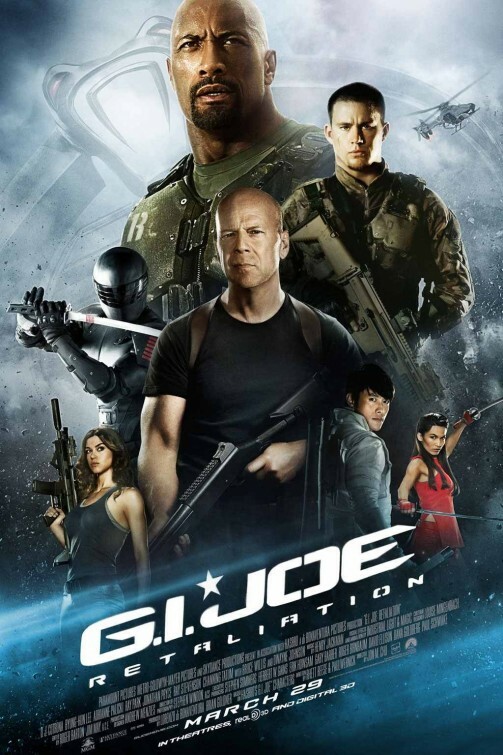 Duke (Channing Tatum) is back as the leader, Roadblock (Dwayne Johnson) can’t be missed, Lady Jaye (one-time Wonder Woman, Adrianne Palicki) can’t be dismissed and then there’s Flint (a vanilla D. J. Cotrona), a blank slate. Next thing these Joes know, the majority of them are mowed down in the Middle East, an attack they realize was ordered by the President. Meanwhile, Storm Shadow (Lee Byung-hun, “I Saw the Devil”) and Firefly (Ray Stevenson, “The Book of Eli”) free Cobra Commander (now played by Luke Bracey, since Joseph Gordon-Levitt has better things to do) from a German prison, leaving Destro on ice and the Warden (the great Walton Goggins) in the dust. Still alive yet mysteriously away during the elimination of the Joes is silent ninja Snake Eyes (Ray Park), pursues Storm Shadow in the Himalayas with his apprentice Jinx (Elodie Young) at the behest of some Zen Master dude (RZA in the most bizarre and awful performance in the movie) that I just couldn’t take seriously. While that side story plays out, Roadblock, Lady Jaye and Flint manage to make back to the States somehow. They get assistance from some bros in Roadblock’s old hood (we learn his name is Marvin, which is as funny as The Rock’s name is Dwayne) on their way to General John Colton (Bruce Willis, on cruise control), the only Joe they can trust stateside. In a scene that reminded me of “RED”, Colton offers his immense cache of weapons (the password to his crib is “1776”, Ooyah!) and some senior testosterone to the group to the trio. Together, with some nameless cronies of Colton’s, they decide to forcibly take back D.C. from the evil grip of COBRA. The big question is determining whether or not this is a “Yo Joe!” or “Oh no!” G.I. Joe movie. I’d say it’s the latter, since we’ve been inundated with all the major “Retaliation” action beats for over a year now and seeing them play out during the movie, well….I was bored. This sequel was originally supposed to come out last June, but Paramount called that off, proclaiming it would need more time for a 3D facelift and, rumor has it, an opportunity to expand Tatum’s role. How’d that work out? Well, the 3D was needless. Unless they wanted all the action to look like action figures come to life (which is basically what this is, right? ), then they succeeded. 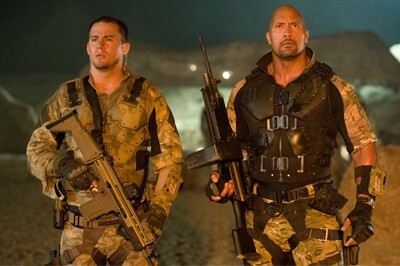 As for Tatum’s extended material, I’m not sure what it specifically was – maybe some bromantic scenes with Johnson – tickling Roadblock’s daughters (we never see their mother, because Roadblock can raise two girls even while he’s off trying to save the free world) or some back-and forth banter that solidifies the requisite macho bonding. What this “Retaliation” is in dire need of is a legitimately threatening villain. It’s as if they were afraid to fully utilize the potential they have with the mirror-masked Cobra Commander. This is a character who needs to have a bugnuts psychotic presence on the big-screen, with a twisted balance of homicidal rage and maniacal leadership. Instead, the character barely “commands” anything, walking in and out of scenes with a voice more indecipherable than Bane’s. He’s overshadowed by the physicality of Firefly, the lame-duck dialogue of Zartan’s President and the cool moves of Storm Shadow (who spends a good deal of the movie working with the Joes). So, it doesn’t seem all that hard for a handful of Joes to topple a terrorist organization this inept. This is a movie designed to keep Hasbro toys on the shelf. Since it has Tatum, Johnson and Willis on board, there will be a sequel. Simple math. It doesn’t matter how much I like those three actors or how much chemistry they show on-screen, in the end, it just doesn’t hold up as anything worthy for them (or the rest of the cast for that matter). Here’s hoping they do something new and exciting with the material they have at their disposal – go big like director Stephen Sommers did with the first movie – or go home. At least “Rise of the Cobra” was having fun with it’s source material, with its large-scale set pieces, over-the-top silly action and wide variety of characters. 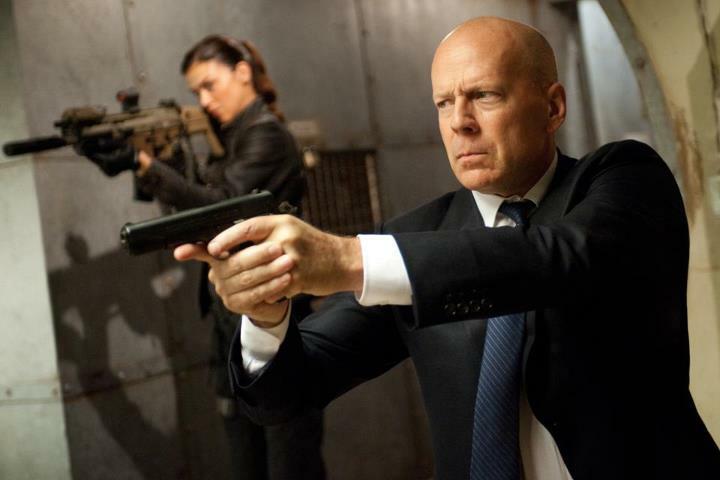 “Retaliation” jettisons all that for a leaner and tighter sequel. The hand-to-hand combat scenes are well choreographed, as one would expect from the director of two out of the four “Step Up” and the documentary “Justin Bieber: Never Say Never”, but it’s just not enough. Nothing stands out here. Nothing is different or better than any of the action movies we see come and go each year. 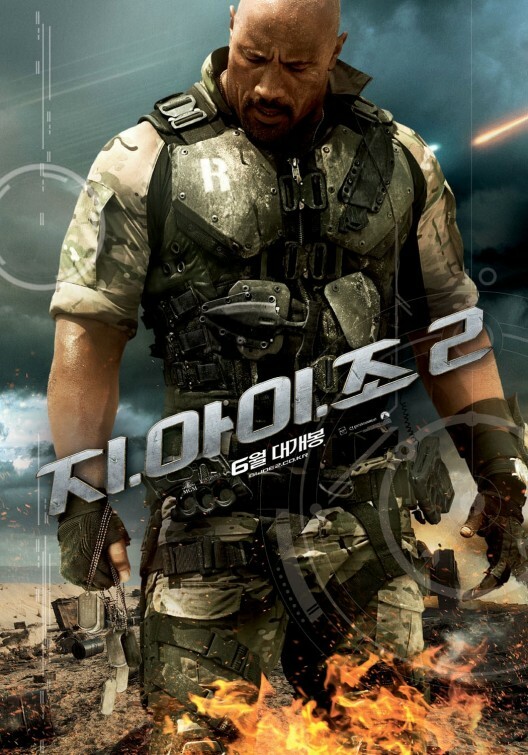 While the sequel has a more streamlined, grounded feel to it and a few fresh faces in the Joe roster, it is in no way the impressive action flick it wants you to believe it is. As far as action goes (which is why people see these movies), it isn’t even really all that different from the first film, but it also isn’t much of an improvement. It’s not doing much of anything actually. In fact, watching “Retaliation” didn’t only bore me, it gave me a renewed appreciation for “Rise of the Cobra”.